I think I've mentioned here before how much I hate to waste things - whether it be food or other useful items such as jars and in this case, spice tins; especially if I can remove the labels off of them or cover them with pretty contact paper. 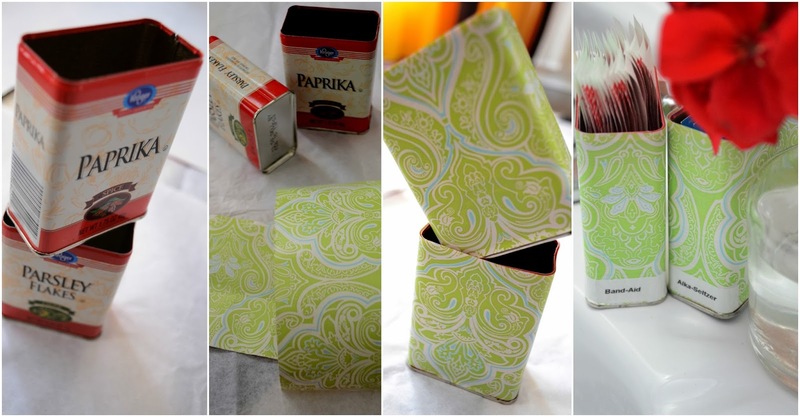 This is one of the simplest upcycled projects that anyone can do using leftover contact paper or wallpaper lying around the home. Using the remnants from this last project, I gave these otherwise boring spice tins a spicy makeover - taking them from trash to treasure. I mean, imagine the possibilities of things you can store in these neat little chic tins? From whitening strips to Q-tips. 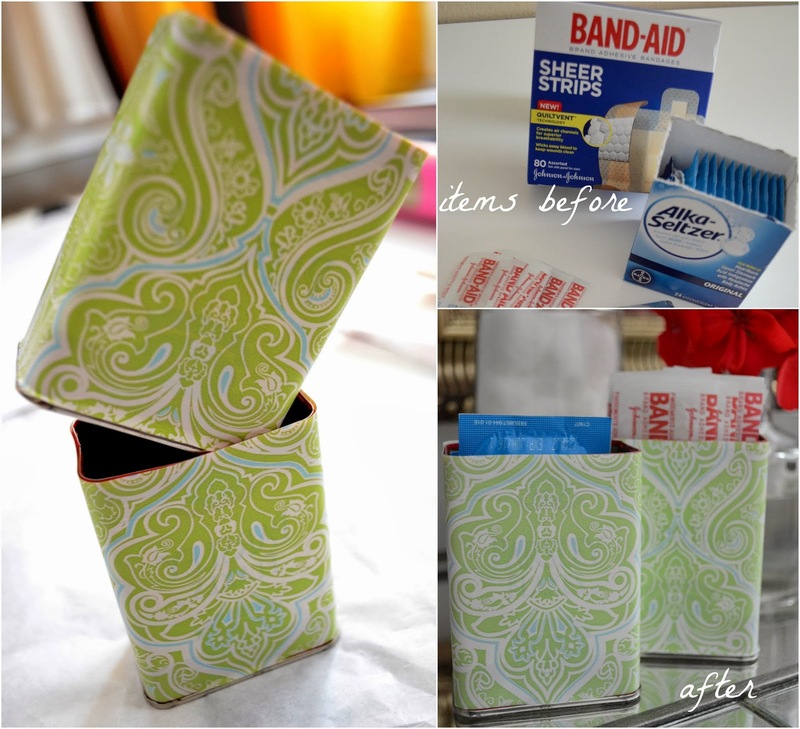 I now, like how my band-aids and alka-seltzer are displayed in a much more elevated style than in their ugly boxes while preserving the earth from unnecessary landfill. The bonus: every time I look in my medicine cabinet for other necessary items - seeing those cute little guys certainly puts a smile on my face. Besides, as you've probably already noticed, I'm not one to settle for an unsightly medicine cabinet. 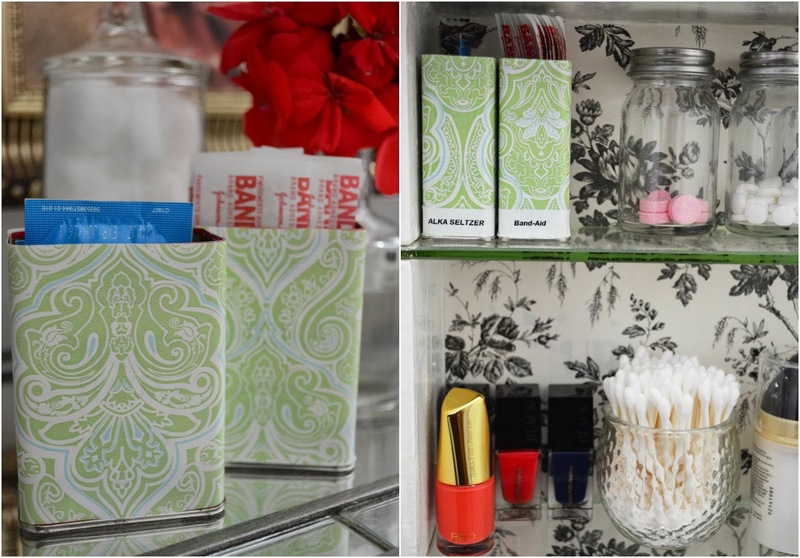 No matter how big or small, renting or not, the medicine cabinet has to be functionally good looking. Sometimes it's just the little things that helps start your day in a better frame of mind. 1. Measure the circumference (from top and bottom right above the bottom lip) of your tin by using either a tape or a string around the tin. 2. Trace out your measurements on the paper side down, adding a little extra so one seam can overlap a little bit. 3. Cut out your tracing all at once to save you time from re-measuring. 4. Once you have all your pieces, peel back off of contact/wallpaper. 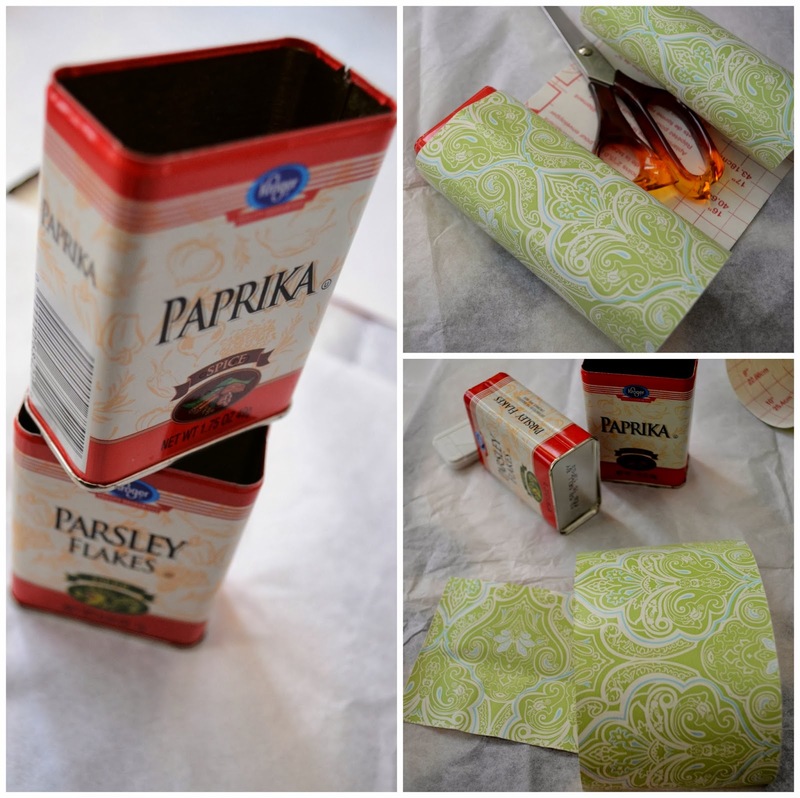 Place your paper in the center on the front of the tin above the bottom lip and pull the paper around the curve of your tin snugly as you press down for a nice smooth coverage, bringing the seam together on the back of the tin's seams. This re-purpose is brilliant! Especially for those with shelves where items are visible. And if you get tired of one pattern, you can change it easily!